(Nanowerk Spotlight) The quest for efficient low-cost solutions for solar energy conversion faces many obstacles, both, fundamental and technical. Fundamental limitations to the maximum achievable efficiency of solar cells stem from a combination of several factors. These include: 1) solar cells inability to use photons with the energies below the electronic bandgap of their material; 2) thermalization of charge carriers generated by absorption of the photons with above-bandgap energies; and 3) the losses caused by recombination of the light-generated charge carriers. As a result, even ‘ideal’ solar cells have maximum intrinsic efficiency – known as the Shockley-Queisser (S-Q) limit – of 33% for the illumination by the non-concentrated sunlight. A number of architectures have been proposed for reducing losses in solar cells in order to overcome the S-Q single-junction limit. These include hot carrier solar cells, intermediate band solar cells, up- and down-converters, and concentrators, as well as cells with nanostructured materials that utilize multiple-exciton generation, exciton fission, and tandem stacking (read more: "Practical roadmap and efficiency limits to nanotechnology photovoltaics"). "The S-Q limit can be exceeded by utilizing low-energy photons either via their electronic up-conversion or via thermophotovoltaic (TPV) conversion process," Dr. Svetlana V. Boriskina, a research scientist in the Mechanical Engineering Department at Massachusetts Institute of Technology (MIT), explains to Nanowerk. "However, electronic up-conversion systems have extremely low efficiencies, and practical temperature considerations limit the operation of thermophotovoltaic converters to the low-quality narrow-gap solar cells." In new work, Boriskina together with Gang Chen, Carl Richard Soderberg Professor of Power Engineering and Director, Pappalardo Micro and Nano Engineering Laboratories, at MIT, have proposed a new way to break the fundamental S-Q limit by using a mechanism of thermal up-conversion. Reporting their results in Optics Communication ("Exceeding the solar cell Shockley–Queisser limit via thermal up-conversion of low-energy photons"), the two MIT researchers, who also participate in the DOE-funded Solid State Solar-Thermal Energy Conversion Center (S3TEC), show that solar-to-electricity conversion efficiency higher than the S-Q limit can be achieved in a hybrid platform that combines a single-junction solar cell and a thermal up-converter. "Within our proposed hybrid scheme, photons with energies below the bandgap of the solar cell are absorbed by the up-converter, which heats up and re-emits photons with higher energies towards the solar cell," says Boriskina. "To make this process possible, both front and back surfaces of the up-converter must have carefully designed angular- and frequency-selective emittance characteristics." 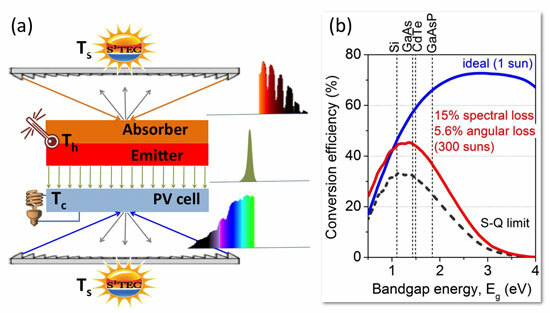 While this work – via rigorous thermodynamic analysis – provides theoretical estimates of the maximum intrinsic efficiency limits of the solar energy conversion in a hybrid system with thermal upconversion, recent advances in nanofabrication technologies put the fabrication of selective surfaces within reach. There are on-going research efforts with various approaches like photonic crystals, nano-cones, domes and pyramids, quasi-periodic planar arrays, and plasmonic metamaterials, to accomplish angular and spectral selectivities simultaneously by the absorber surface design. Boriskina and Chen predict that the maximum efficiency of a hybrid device utilizing the thermal up-conversion scheme can reach 73% for the ideal spectrally- and angularly-selective emittance characteristics of the up-converter surfaces under illumination by the non-concentrated sunlight. "Reaching high up-conversion efficiency requires raising the up-converter temperature, which for the commonly used photovoltaic materials – e.g., Si, GaAs, CdTe, and GaAsP – lies within practically achievable 900-1600K range," notes Boriskina. "Detailed analysis of non-ideal up-converter surfaces that allows for reasonable absorption and emission losses still yields limiting efficiency values exceeding 45% for moderate optical concentration of 300 suns." The bottom line is that the proposed hybrid platform offers new opportunities for reaching high solar energy conversion efficiency under low levels of optical concentration achievable via simple low-cost technological solutions.